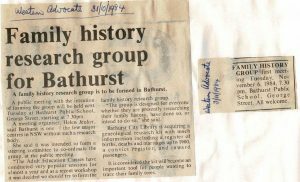 The idea of forming a Bathurst Family History Group originated when Carol Churches, at the request of the (then) Department of Adult Education, conducted classes on Genealogy for Beginners at the Kelso High School in the early 1980s. This led to a research day being held at Kelso High School. Jan Thomas, a researcher from Sydney, attended the research day to provided assistance. Jan brought several microfiche readers and other research material. When it decided that a Family History Group should be formed, Jan kindly donated several large microfiche readers to start us off. A public meeting was held in the hall at the Bathurst Public School in George Street on November 6, 1984, with 34 people present. The meeting resolved to form the Bathurst Family History Group. During the early years of the Group’s funds were a little light on, and the committee members needed to pay their annual membership fee in May, rather than July, so that there were sufficient funds to pay for the printing of the June copy of the Group’s magazine, The Carillon Chimes, and the insurance. The first copy of the Carillon Chimes (so named because of our War Memorial Carillon whose bells ring out across Bathurst) was produced by Bill Deeley in March 1985. At this time there were 52 members — with 10 of those still members 33 years later. The president at that time was Helen Jeuken, who wrote in the first journal: “I personally feel that most of our ‘teething’ problems have been surmounted and, judging by the enthusiasm, see a prosperous, long and happy future of the Group which was much needed to be formed in Bathurst.” Early meetings continued to be held at the Bathurst Public School until we moved into rather cramped quarters in the Bathurst Library, when it was a part of the Bathurst Council Chambers on the corner of Russell and William streets. When the new Library and Art Gallery opened in Keppel Street in 1991 the Group moved there. We now have space for our wide range of resources, and members and the public can access them during library hours. The Library also has a room which is available for our meetings. This arrangement has proved very satisfactory for both the Group and the Library, with good co-operation between members and the Library staff. A small group of members spent about eight years bringing our publication Bathurst Pioneers: A register of Pioneer Families of Bathurst NSW and District before 1900 to fruition in 2007. A transcript of the headstones in the Bathurst Cemetery was published on CD in 2003. This has now been updated after rechecking and photographing all of the headstones in the cemetery. A new searchable CD has been produced. 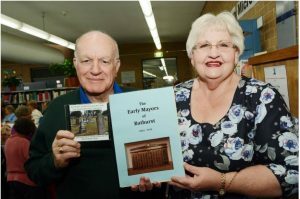 A book recording the life and times of the early mayors of Bathurst (1863-1915) was also launched at the 30th birthday celebrations. The Group has a research team at the Library every Tuesday afternoon from 2pm to 4pm to assist members, and the public with their family history research. As at 1 June, 2018 the Bathurst Family History Group Inc has had a total of 1,084 members during the 33 years, and at present has 277 financial members.